BMW shorts | What Car? 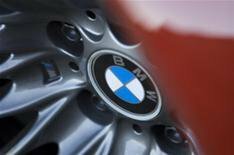 BMW has revealed its lowest emission car yet, the 116d. It is available as a three- and five-door model. The 113bhp four-cylinder engine averages 64.2mpg and emits 118g/km of CO2. Performance is not unduly compromised, either, with the 116d having 192lb ft of pulling power and hitting 0-62mph in 10.2sec. A new 2.0-litre petrol engine has also been added to the 1 Series range, with 122bhp and pulling power improved to 136lb ft, up 18lb ft. That means a 0-62mph time of 9.8 seconds on the three-door model, fuel consumption of 45.6mpg and emissions of 143g/km of CO2. It is expected to go on sale in the UK this spring. The new BMW 7 Series isn't so new anymore, but the long wheelbase model is being displayed for the first time in Geneva. It is powered by a 242bhp diesel that is being sold in the long wheelbase 7 Series for the first time. Apart from being longer, the car is the same as the standard model.